Hakata Gion Yamakasa is an annual summer festival held from July 1 to 15 by Kushida Shrine in Fukuoka City, Fukuoka Prefecture, which is the center of Kyushu in the southwestern part of Japan. With a history stretching back over 750 years, in 1979 it was designated an Important Intangible Folk Cultural Property. In 1241, to drive away an epidemic in Hakata, a high-ranking priest was carried by local residents around the town on a shelf and sprinkled holy water along the way. The Hakata Gion Yamakasa of today evolved from this event. A Yamakasa is a portable shrine to carry a deity during a festival. 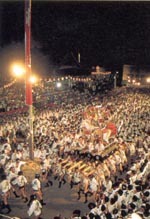 There are two types: the Kazariyamakasa (decorated floats) and Kakiyamakasa (carried floats). Kazariyamakasa are enormous, about 16 m (17.5 yd.) high. They are decorated with magnificent dolls that illustrate various historical or legendary tales. During the festival they are displayed in different parts of the city, where people can enjoy looking at them. By contrast, the Kakiyamakasa are 5 to 6 m (about 6 yd.) high, and weigh close to a ton. Seven floats are made for the festival and on the final day they appear in a race known as Oiyama. At the climax of the festival, local teams carry the Kakiyamakasa and race at full speed along a 5 km (3.1 miles) course. At 4:59 a.m., with the beat of a drum, the first team carry its Kakiyamakasa and depart from Kushida Shrine, with the others following at 5 minute intervals. The teams compete to complete the course in the fastest time. Despite the early start, the spectacle attracts 850,000 tourists from all over Japan. The team yell the traditional chant, "Oissa! Oissa!" as the excitement peaks, and throw water on the men as they pass to cheer them on. The headlong dash lasts for about 30 minutes, as the several-hundred members of the teams take turns carrying the float, which requires 32 men to carry, in a fever pitched atmosphere.